You look at one every day in the mirror, but how well do you know how to capture a human face on paper? It is with great pleasure that we welcome Jake Spicer to the studio for a weekend dedicated to drawing portraits! So why not come and be taken under the wing of one of the UK’s most accomplished drawing tutors? With an emphasis on enhancing your observational skills, Jake will guide you in capturing the human portrait on paper. Through a series of demonstrations, exercises and one-to-one tuition you will study a model and explore a practical method of sketching the head from any angle. As you progress through the weekend, your efforts will focus on drawing specific parts of the face, exploring the qualities that are required for a convincing likeness. 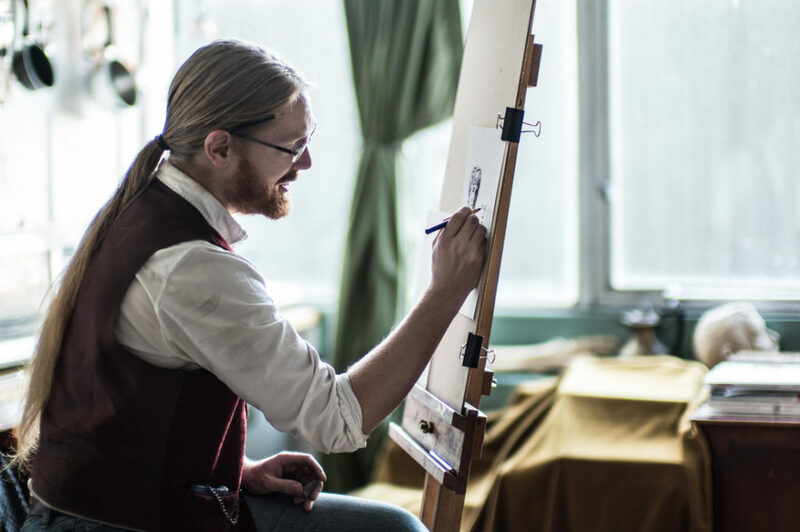 So whether you’re complete novice or an experienced artist in need of a refresher, we guarantee that you will not only leave feeling inspired but also with the confidence to take your newfound skills further. Observational skills and capturing a portrait. Explore the mark-making required to draw a portrait and develop a practical method for sketching the head from any angle. Structuring the features of the face, giving attention to the eyes, nose, mouth, ears and hair. Exploring the qualities that are required for a convincing likeness. Anyone, regardless of experience – we generally advise 14 years old+ though. Please note that the life model will be undressed throughout the class. After the weekend you will be armed with many new skills to incorporate into your own art. There are opportunities for you to continue to explore these at the Phoenix Studio (at The Drawing Circus weekend, our monthly life drawing classes and our other courses). We can also point you in the direction of other classes and venues local to you. Jake has also written a number of excellent, accessible books about drawing if you wish to study his teachings further, signed copies will be available to buy from Jake during the weekend. The leader of the Drawing Circus, Jake is passionate about drawing and is equally passionate about teaching. He’s a busy man – teaching multiple classes around the country – in Brighton, at West Dean College, touring with the Circus, The Camden Arts Centre and The National Portrait Gallery. He write books about drawing, has a monthly column for Artist & Illustrators magazine and gives lectures and classes on the applications of drawing as a tool for understanding, communication, artmaking and as a vehicle for social good. He is also undertaking a long term study into the fundamental processes of drawing and also paints when he can. In the past he has worked with the BBC, ITV, Brighton University, The Big Draw, The Old Market Theatre, Creative Futures, Playgroup Festival, Brighton and Hove Museums & RAM, among others. You can have a look at his website here.